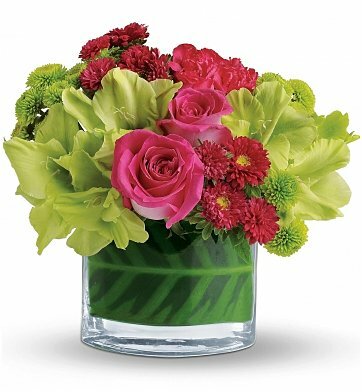 A leaf-lined vase filled with water holds fresh flowers such as roses, gladioli, mini carnations, asters, and button spray chrysanthemums. Contemporary and lovely, the unique bouquet is the perfect choice for anyone who appreciates style. Secrets are even better when they're shared, so send this gorgeous bouquet to someone you care about today! Beauty Secret Bouquet is a hand delivered gift. These gifts are delivered by one of our local design centers located throughout the United States and Canada. Same day delivery is available for most gifts when ordered before the cutoff time. The cutoff time for Beauty Secret Bouquet is 2 PM in the recipient's time zone. Flowers were delivered as requested and were beautiful. Was sent a photo two days later and still looked good! This company did a great job! The flowers were gorgeous and smelled great; the arrangement was pretty, the vase was gorgeous, the service was on time, and the delivery lady was really sweet. I would totally use them again! Of course, I have not actually seen the arrangement but the recipient was thrilled with it and said it was lovely. Am pleased if she is pleased. Centerpiece for my friends brunch, it was perfect. They had to substitute one of the types of flowers but arrangement was still beautiful and they called to let me know of the substituition, nice service. They were delivered when promised and were very pretty. I would definitely recommend this site. The growth for this Beauty Secret Bouquet was not totally available for the needed delivery timetable. Fortunately, the florists designed a bright, cheerful, elegant arrangement in the 'bouquet' designated vase. The gift was excitedly received and greatly appreciated on this early January birthday.